So I have published a book. It seems like it wouldn’t be that big of a deal. Hundreds of books get published every day, both “legitimately” and through self-publishing. It’s astounding the number of options we have to read. It takes a great deal of hubris to stand up and say, hey, I think you should read this book even though there are all of those other choices out there. So, hey, I think you should read this book even though there are all of those other choices out there. 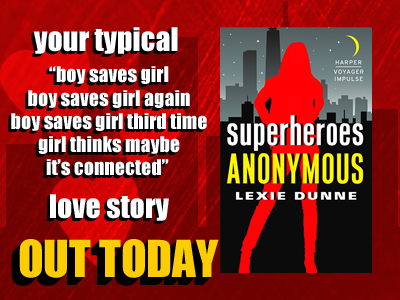 I’ve been struggling since I got the news from HarperCollins that they wanted to publish SUPERHEROES ANONYMOUS. After the shock had a little time to subside and the happiness finally calmed to a level where my thoughts were coherent, self-doubt began to creep in. What if, my traitorous little snitch of a brain said, what if it’s a hoax? What if they picked your book to just be a shelf-filler? What if you were a pity-pick? Self-doubt is my greatest enemy, and it’s something that’s dogged my heels the entire way on the road to publication. The Impulse team arranged to get me on a panel at NYCC and I spent weeks close to hyperventilating at being in front of that many people and pretending to be something I’m not, which is knowledgeable and capable and—screw that noise, I AM that person and I’m awesome. My first round of edits turned me into a shell of myself, where all of my thoughts were consumed with what I need to do now and if character A makes this choice then character b needs to do this so that ending z will make sense and what’s that weird orange stain on this shirt? I just washed it three wears ago! (hygiene: the first thing out the window on a deadline!). Like I said, it’s been there, every step of the way with its insidious little fingers smudging up every good thought. What if your publishing day never comes? It came. It’s here. It brings with it some truths that have nothing to do with doubt and everything to do with reality. Truth #1: I am a published author. I. Am. A. Published. Author. Words I have wanted to say since I was thirteen and scribbling about some teenager getting dragged into another dimension with dragons. Words I’ve secretly kept inside my heart and kicked around in the darkest corners of my mind because wanting a dream you might never achieve can physically hurt. Words I’ve been afraid of because the term be careful what you wish for has been hammered into the mind of every fairy tale lover since the dawn of storytelling. My book is for sale. My book is available. These are words I can say aloud now. Truth #2: I have a new companion on this road and her name is Gail Godwin. However the book does—and I have no idea how it will because the principles of the Claw are at work—to the world, Gail Godwin is my first. Maybe she’ll go on to do great things and maybe she’ll fade into obscurity, but nothing changes the fact of the matter that she is the first character I introduced as a published author. Doubt may come with me down this road, but so will Gail and to me, that’s more fitting than you know. See, I created Gail when I was not at a happy point in my life. I was living far away from pretty much everybody I knew, working a job that was interesting and exciting but one that I was not great at and one I had no passion for. You know what it’s like to work in a highly competitive field where you’re only passable good at things and where you’re told regularly that there are fifty people just clamoring to take your place? It eats away at the lining inside your head and Gail was my way of fighting back against that mental erosion. She was this down-on-her-luck-lacking-in-self-confidence woman who’s been through hell for years and years when the book starts, and she’s finally given this break…and she does nothing but coast for a little while until other things nudge her out of it. And I don’t want to spoil too much of the book (the plot I’ve told you is literally the first two chapters), but it’s a story about power, both the self-empowering type and the physical. Gail was a character I needed to write at that time. I love her. I find her frustrating and anger-making and hilarious and endearing and a thousand different things, and I’m terrified for her now that she’s in the hands of others, but in a lot of ways, I’m glad she was the character that was first. I have so many others sitting in drafts on my hard drive. Abby, Dane, Ayla, Audrey, Thia, and Maggie and Smoke, all of whose stories meant a great deal to me, but not as much as Gail did, really. So now I have Gail Godwin with me, and that makes me smile. Truth #3: This is a peak. Now we enter a valley. Book 2 (with a tentative title) comes out in June. For a little while, I’ll be out spreading the love for SUPERHEROES ANONYMOUS and good god do I hope it takes off like a speeding train, but right now, this is a great high point to see the world around me. In the coming months, I’ll be hard at work at the sequel and a separate writing project, and that’s hopefully going to be my life from now. It’s a cycle, and that’s inherently fascinating. But even though the valley I coming, and I know it is, I’m still interested to see where we go from here. Truth #4: I have a lot of people to thank. I could have gone on for pages in my acknowledgments with all the people that I’m grateful to. On Facebook, Twitter, and Tumblr, all day people have been promoting SUPERHEROES ANONYMOUS. They’ve been tweeting funny things, and pictures of otters and wombats, and talking about the book and driving excitement, and that is incredibly humbling. Writing is, at the end of the day, a solitary activity. It’s you and a keyboard and maybe your alpha and beta readers to keep you company, but eventually you’ll end up sitting in a room by yourself, hunched over and searching for just the right word. So to emerge from that and have so many people cheering me on, excitedly posting pictures of the book on their e-readers or forwarding the emails, tweeting and reblogging…I started crying this morning because of an email and I just sat there and bawled for a good half hour. Hell, I’m tearing up now. I like to tell people I traded up my heart for a nice lump of coal, but all of this, it touched me. It’s not just the support system, like my parents and the people I talk to every day, my friends and my agent and the professionals. It’s everybody. It’s this unbridled enthusiasm. And it’s ALL OVER THE WORLD. I sent out postcards this week to countries all over the place and you have no idea how hard that was to wrap my brain around. So to everybody: thank you. Thank you from the bottom of my heart. You’re wonderful and you’re the real superheroes here. But anyway, this post went beyond the levels of sap that I’m comfortable with like 700 words ago, so I’m gonna pretend this never happened. Except this part: I am a published author. Dude, it's been years since we've figured out you're a softie... And you're still cool!